Chiggers (Eutrombicula spp. ), also known as "red bugs" and "jiggers," may have a greater itchiness-to-size ratio than any other pest. The tiny, parasitic larvae of eight-legged mites, chiggers can infest your landscape, and you won't even know it until you start scratching the red welts they leave on your legs and ankles after a summertime stroll outdoors. Fortunately, you can get rid of chiggers by altering your outdoor environment or spraying with a bifenthrin-based insecticide. Chiggers often nest in Spanish moss that falls to the ground. Chiggers are attracted to moist, shady environments with a lot of vegetation, often harboring in tall grass, weeds, brush, berry thickets and fallen Spanish moss. Make your landscape less attractive to the critters by pulling weeds, cutting grass short, cleaning up plant debris and removing thick underbrush. Doing so helps promote better sunlight penetration while lowering the relative humidity level, which should deter chiggers. Pruning dense shrub interiors also helps eliminate damp, shady hiding spots for chiggers, but dip your pruning tools into a solution that is 1 part chlorine bleach and 9 parts water before starting and between cuts so you don't spread the pests to other areas of your landscape or spread plant diseases. Chiggers occur in clusters throughout outdoor landscapes because the adult females lay all of their eggs in one location and the larvae that hatch don't venture far. So one area of your yard may host no chiggers while a spot just a few feet away has thousands of the pests. It makes sense to spray pesticide only on chigger "hot spots" rather than your entire outdoor landscape. Identify the hot spots by setting pieces of black cardboard or thick paper against vegetation throughout your yard and garden. Include areas where people and pets wander, such as along fences, pathways, picnic areas, doghouses and swing sets. Within a few minutes, chiggers should start crawling up the cardboard to congregate at the top. They look like tiny red, orange or pink dots that you can see if you use a magnifying glass. Mark all hot spots you find so you can treat them later. Using a bifenthrin spray can reduce a chigger population by up to 95 percent, but the relief lasts only several weeks, according to the University of Nebraska-Lincoln Extension in Lancaster County. Bifenthrin pesticides come in ready-to-spray forms that take the guesswork out of mixing. Following the directions on your product's label, hook the spray bottle to a garden hose, and spray the solution evenly over the identified hot spots, covering all plant surfaces to the point the solution runs off them. Spray the ground, grass and other low-lying vegetation, and apply a band of the solution on the bottom 3 feet of shrubs and trees. Repeat the spray treatment as often as necessary, but wait at least seven days between applications. Avoid using bifenthrin on or near edible plants, and promptly rinse off all spray that drifts onto those plants with clean water from a different garden hose than the one use used to apply the pesticide. Bifenthrin is highly toxic to fish and other aquatic life. So avoid spraying it near streams, creeks, ponds and other waterways. The chemical is also very toxic to bees that make direct contact with it. Therefore, avoid spraying blooming plants. Spray on only windless days when no precipitation is expected for at least 24 hours following the treatment. Keep people and pets away from treated areas until the spray dries. Whether checking for chigger hot spots or spraying your landscape for chiggers, wear protective gear. Put on a long-sleeved shirt and long pants that you tuck into socks or boots; also wear a hat. Avoid bifenthrin eye and skin irritation by also putting on goggles before spraying your yard for chiggers. Spray an insect repellent containing diethyl toluamide, or DEET, on your clothing as well as on your ankles, legs and waistline, following the instructions on the product's label. As soon as you go back indoors, take a hot shower to rinse off the DEET repellent as well as any chiggers that made their way onto your body. Wash your clothes right away as well. The common belief that Spanish moss (Tillandsia usneoides), hardy in U.S. Department of Agriculture plant hardiness zones 8 through 11, is a chigger magnet is not quite true. 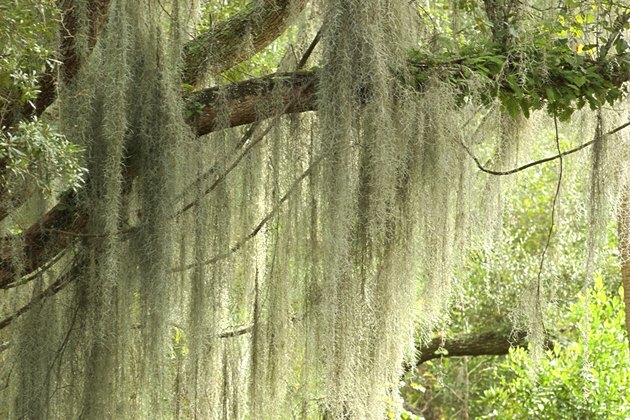 Although the tiny pests nest in fallen Spanish moss, just as they would in any low-lying plant, they don't climb high enough to reach Spanish moss thriving in treetops. This means you don't need to treat Spanish moss you gather from trees, but treat Spanish moss you collect from the ground before using it for crafts or as mulch. Before touching Spanish moss, put on work gloves, a long-sleeved shirt and long pants so any chiggers present won't irritate your skin. Separate large clumps of the moss into smaller pieces, and pick out visible insects, spiders, lizards and debris. Then place the pieces of Spanish moss in a paper bag, put the bag in a microwave oven and heat it at the appliance's high setting for about 30 seconds to kill chiggers. Scrub your hands and arms with warm water and soap afterward just to ensure the pests didn't reach your skin.